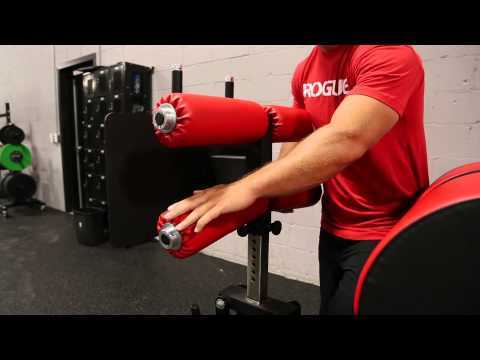 Rogue's Monster Swing Arm GHD (Glute Ham Developer) takes the popular Nebula GHD model and upgrades it with Monster-sized pads, two step-up decks, and a redesigned, fully adjustable rear foot-rest. An easy-to-use handle at the base of the machine allows athletes to reposition the foot pads back or forward to meet almost any workout requirement. The foot pads and foot plate are vertically adjustable, as well. With a compact steel construction, the 250LB Monster Swing Arm GHD offers plenty of stability on its own. This durability, combined with the machine's versatility, makes the Monster Swing Arm GHD one of the most effective hamstring and glute strengthening tools on the market. Important: The Monster Swing Arm GHD is a built-to-order product and may require a 3-6 week lead time. The GHD shown above uses a custom color configuration. All Monster Swing Arm GHD's will include Rogue's signature black powder coat and solid black hip and foot pads. Rogue Monster Swing Arm GHD is rated 5.0 out of 5 by 4. Rated 5 out of 5 by Brian JM from Definitely a luxury GHD, but undeniably top notch To own a GHD that is more expensive than your power rack is probably silly to most people, but this thing is undeniable. Like most Rogue items, it is robust and well crafted but what pushes this GHD into this price point is its ability to resolve any potential gripes one could have: "I don't like having to step over the foot pad adjustment bar", - there isn't one on this model. "I don't like the pad spacing", - the pads on the footplate are tapered to accommodate to various sizes. "I don't like that the sturdier a GHD I want, the larger the footprint gets" - ironically, this Monster version actually has a smaller footprint than the two other offerings. The only gripe one could have is the price, but when comparing to other commercial grade GHDs, Without question, I'm choosing this one over the more expensive, and gigantic ProMaxima or Hammer Strengh commercial GHDs. To summarize, this GHD is definitely a luxury GHD for home use. The Abrams 2.0 will satisfy if not completely exceed most people's needs but having own one at home, it would be tough to convince me to swap my Monster Swing Arm GHD for the Abrams 2.0. I was fortunate enough to buy mine from a friend so I did not have to factor cost the same way. Rated 5 out of 5 by Brando from Yes, this is a Monster I debated between this version and the 2.0 for over a year. As you see in my pics, I have a tight spot where this needed to go and the ten inches in width that I saved with the Monster pushed me over the edge. I know it’s a lot of money for something that can be done for half the money with the 2.0 but I’d do it again in a heartbeat. It’s just a beast! The deck is all welded and everything arrived in one piece. It’s bolted to a pallet and arrived flawless. As a bonus, it has wheels attached to the front that make it portable enough to get into your desired location. Also comes with rubber feet that you need to attach after unbolting it which was a nice surprise. We put it through the paces last night and it functions perfectly. Swing arm is easy to adjust as is the pop pin foot plate. You sit nice and high on this so you can get a good stretch when doing sit-ups and back extensions. Also works great as a reverse hyper by using bands or ankle weights. There isn’t too much info on this version so I wanted to let potential buyers know that it’s a solid 10. It’s overkill for the average home gym but it is so well built that it justifies the price. If it wasn’t for the size issue I would of went with the 2.0 and saved some coin. I have zero regrets though. The cool factor Is off the charts. Rated 5 out of 5 by Nebby baby dork shrimp from Top notch! Glad to see nebula's design being used. I have both the nebula and the rogue version. Paint seems to chip fairly easy on the rogue version. Overall a great piece of equipment. Rated 5 out of 5 by Daniel Johnson from APOCALYPSE READY!!!!!!! This baby meets all expectations. I previously had an Abram. And for the money it's not bad but I wanted Rogue to come up with a GHD that was sturdy and extremely easy to switch lengths. Behold the MONSTER GHD with swing arm. I can't tell you how long I waited for this thing and it was worth every bit of it. Now to clarify we are not a crossfit gym. We are a true strength and conditioning gym. We don't do that "situp thing" on here. We use this for GHD raises and Back extesions. And this thing is perfect at those. I highly recommend this item for anybody looking for not just a good GHD but the best. Thank you Rogue for putting in so much workmanship on this thing. Your work speaks for itself.